Successfully Added Magnetic Levitation Globe with Blue LED Lights to your Shopping Cart. 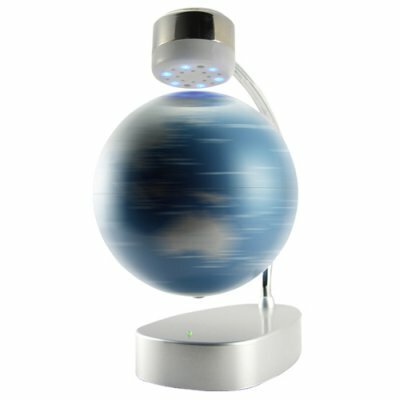 Magnetic levitation globe with blue LED lights to bring balance (feng shui) to your surroundings all year round, and help you meditate to achieve enlightenment. Magneto will be impressed! This is an awesome high tech gadget that people of all ages will enjoy. To have something hovering, levitating, floating and giving the illusion of anti gravity is extremely nice to look at, and most of all, to have as a decor ornament that goes well with any style of home and office furnishings. This high tech gadget also comes with an LED light feature that makes it look very cool when turned on in the dark. The CVSB-G45 is operated by an electronically controlled magnetic system. The magnetic head above the globe contains an electro magnet and a magnetic field sensor. The base contains a micro-processor and the electronic control components that makes the globe levitate. The top head above the globe also contains 6 blue LED lights to give it that extra special look when powered on. The CVSB-G45 hovering globe is simple to install, it works straight out of the box, and within a couple of minutes you will have mastered the ancient technique of magnetism. Once you get the globe levitating, just give it a little spin with your finger and watch it rotate for an extended period of time. This cool gadget makes a great display unit for your retail shop, business and home. This is yet another wonderful and amazing gadget that is perfect for personal/company use, resale, online or physical store, and is brought to you straight from the leader in direct wholesale electronics, Chinavasion. keep the Globe away from other electronic devices, etc. computers, USB keys, Media players, etc. Does the CVSB-G45 operate on a battery? No, the levitating globe comes with an AC 100-240V power adapter. It's a small globe of the earth, fairly detailed in the map, that will hover under the magnetic top with blue LED lights. It spins slightly to maintain it's hold which is neat. If bumped, the globe will usually fall off and stick to the nearest metal object, but it's easy enough to put back into place. A good addition to any workspace needing that little extra something.